This week's Blues Brothers 7" is essentially identical to the one I posted two weeks ago. It has the same songs and the same recycled picture from the Made In America album cover. The only real differences are that it's from Spain rather than France and the font that they chose for the title on the front of the sleeve is different. This time out they opted for a boxier font rather than the bigger more cartoony one of the French version. I'm still not exactly sure why the American version of this 7" didn't get a picture sleeve, but then again I'm also still trying to wrap my head around why there are so few images available to be used for all of these different releases. Regardless, it's another fun one for the collection. I'm definitely getting close to having gone through all of these. I keep hoping some of the ones I'm missing show up on Discogs pretty soon. We'll see. It's always a blast to discover a new band that is wielding their guitars for the forces of good. Stand Alone are from Japan and like so many other bands from that wonderful country are playing just the kind of rock and roll that my ears wants to hear. 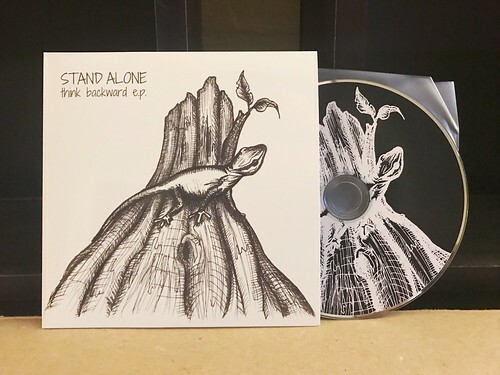 Stand Alone are cut from the same cloth as many of the great Snuffy Smiles bands from the late 90s and early 00s. There are two singers which gives the band a dynamic vocal range that can go from sounding a bit like Screaming Fat Rat all the way down to a gruffer, more melodic delivery not unlike what you would hear in a band like Shipyards. Musically there's a mix of big crunchy power chords, energetic octaves and slower, jangling note picking. If there's one criticism from me, it's that at four songs (with one an instrumental), this EP is too short. I want to hear so much more from this band. I'm pretty blown away by my first time hearing them and can only hope they have more songs like these that I'll get to hear in the future. This little slab of noise comes via Big Neck records. 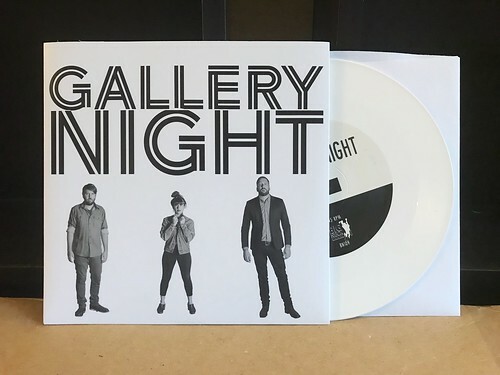 Gallery Night recorded a bunch of songs and then split them up on 7"s over three labels; Dusty Medical, Tall Pat and Big Neck. I can't speak for the others, but the three songs on the Big Neck 7" are something. I'm not use to hearing this sort of thing in 2018. The sludgy guitars and pounding drums make me thing of 90s institutions like Hammerhead, Karp or the noisier moments of Unwound. The production in particular is great, with deep, throbbing bass and perfectly mixed vocals that you can hear above the roar, but don't end up being a bunch of unrecognizable screaming. While I'm always happy to have more bands that bring back the 90s heyday of varied and intense rock and roll, this 7" just doesn't quite hit me as hard now as it may have if I'd heard it twenty years ago. That's not to say it's bad or not well done for what it is, it's just not something that I see myself listening to all that often. If you were a bigger AmRep fan than I was, your milage may vary. There was definitely a period in the mid 90s where I would have told you without hesitation that the Mr. T Experience was one of the best bands on the planet. The way they combined essential pop punk hooks with lyrics that were way too smart for me to completely process put them head and shoulders above so many other bands of the era that were mining the same influences. While I can't say I followed them every step of the way after a certain point, they went on a multi album spree for a while that is an essential part of my record collection. 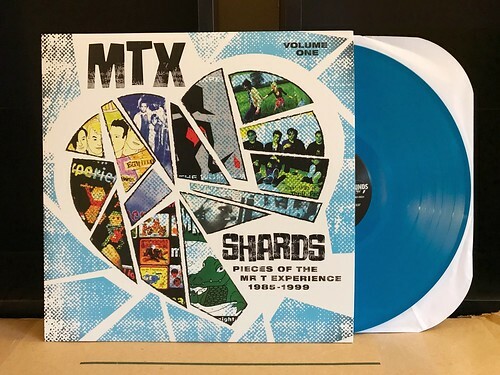 Shards compiles a bunch of 'lost songs' from a large swath of time that the Mr. T Experience was active. Most have been released on compilations, singles or hastily added tracks to the CD versions of some of their albums. For many, this is their first appearance on vinyl. There are some that have been long time favorites of mine such as the Shonen Knife cover "Flying Jelly Attack," "Semi-OK" and one of several iterations of "God Bless America." There also a few that I've never heard including an interesting version of "Sackcloth and Ashes" that is just Dr. Frank and bucket load of tremolo. I dig the way the song is stripped bare and allows the vocal melody to really shine through. The entire album is surprisingly consistent in sound and song quality considering the different sources of each of these songs. I enjoy finally having these songs in one handy place on vinyl. There's a volume two out there digitally, I can only assume it'll make its way to vinyl at some point as well. After that, I hope they get around to doing a proper singles compilation of all of those tracks that aren't on studio albums. Again, would be nice to have those all in one place for a quick spin on the turntable. I will admit, I've had this album sitting around for a a while, unsure of what exactly I wanted to say about it. I find it kind of perplexing and it's difficult to articulate the things about it that don't quite land for me, but without insinuating that it's inherently bad. The album was sent to me to listen to by the folks at One Percent Press. 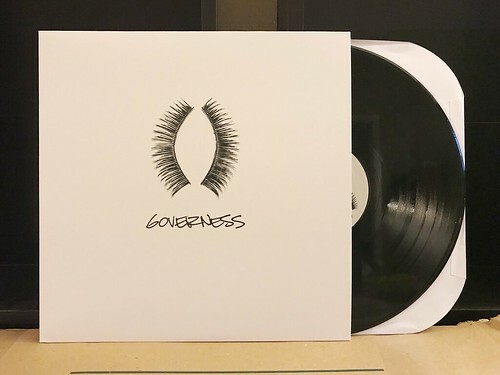 It's an LP reissue of Governess' self titled album, originally only released on cassette. For that reason along OPP and co releasing label Radical Empathy should be commend. I'll always support liberating albums from tape hell. That being said, this isn't really the sort of album that I would really ever listen to all that often. The production on the entire record is very soft. Instruments register in the background, sometimes seeming like they were recorded on a different plane, not quite in the studio and not quite of this dimension. The vocals are otherworldly, giving a gentle but haunting vibe and they glide over the sparse drumming and even sparser guitar work. If you are looking for something that's perhaps a bit more chill than your typical punk rock diet or if you are a bit more into soundscape type stuff or albums that make strong use of audio texture, this might be up your alley. For me, it's just kind of pleasant background noise. Not present enough to offend or delight. 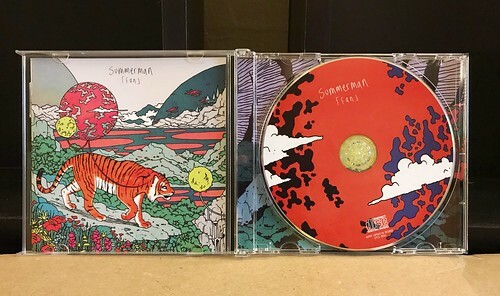 One of the best discoveries I made when I went to Japan last year was a band called Summerman. Their last album Temperature Is... has been on a non stop loop ever since I picked it up. It's just one of those perfect albums. Now Summerman is back with their sophomore full length called Fan. It's aptly named as I am a huge fan of these guys. While I tend to favor the Japanese bands that slide a bit more easily into the Snuffy Smiles style of gruffer punk rock, Summerman wins me over with their sheer mastery of hooks and ability to build song structures. Summerman has more in common with bands like Silver Scooter or Falls. They construct their songs using delicate layers of jangly guitar lines coupled with a forceful rhythm section that keeps the energy level way up. There are three guitar players in this band and while the punk rock part of my brain sees that on paper and thinks it might be overkill, when my ears actually hear the complex, but supremely catchy melodies they create with this set up, it's hard to argue its effectiveness. Let's not also forget to mention, they cover a Chester Copperpot song on this record, which is absolutely insane to me. Their treatment of "No Wonder"is a revelation, giving the song a fuller sound and a different vibe while still maintaining the same levels of pure joy that the Chester version manages to convey. I do wish this had come out on vinyl and I'm hopeful that one day it does get released in that format. But no matter what format it could possibly come out on, there's no denying how great Fan is. Summerman has put out a pretty stellar release and it's one of the albums I've been listening to the most this year. Absolutely worth checking out. I've said in the past that Snappy Little Numbers has become one of those really trustworthy labels over the past few years. It feels like nearly everything they put out is fine tuned to appeal directly to me. 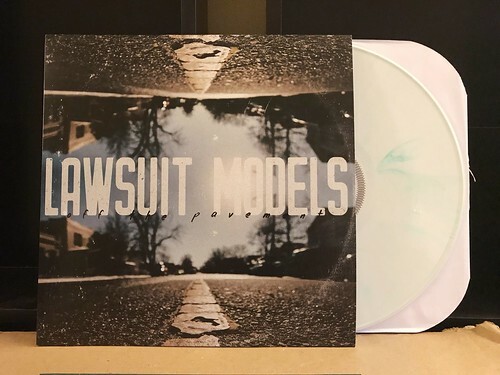 Lawsuit Models is no exception to this. It's another great album filled with big hooks and 90s style rock tunes. The thing that immediately jumps out as a comparison point for Lawsuit Models is the band Pollen. Especially the later, Wind Up records album Peach Tree. While musically, they are somewhat similar, each having a knack for crunchy guitars and simple, but extremely catchy riffs, it's really the vocals of one of the singers that evoke the memories of Pollen. There is a slight rasp, not to the extreme like a Frankie Stubbs, but one that evokes a warmth and a familiarity that allows the lyrics and melodies to really sink in. There is another singer whose vocals lean towards a more straightforward punk rock delivery, but they're no less effective and these songs give the album a jolt and keeps things dynamic and interesting throughout. If it isn't obvious, I really dig this record. These guys may not be on your radar, but they really should be. Particularly if you're one of the dozen or so people that picked up Pollen CDs out of the $2 used bins during the 90s. 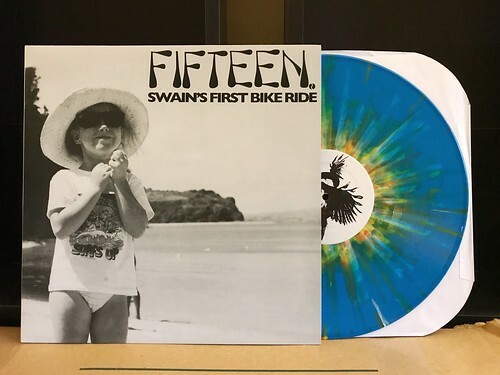 I probably mentioned when I reviewed the reissue of the first Fifteen 7" a few months ago that I have been embarrassingly unfamiliar with this band until very recently. While I've been a huge Crimpshrine fan for as long as I can remember, for whatever reason, I never followed along with Fifteen during the bands initial run of records. Luckily there's a bunch of reissues going on right now, making it easier to catch up. While I was left pretty flat with the Liberation 7", Swain's First Bike Ride is much better and way more up my alley. I hear a lot more of the scratchy guitar progressions along with Jeff Ott's distinctive rasp. It's not as all over the place as the 7" was as the album has a more consistent and cohesive sound, fitting right in with the sort of thing going on at Lookout records in the late 80s and early 90s. Where the 7" felt like a bunch of songs thrown together, this feels more like an album. I still have a long way to go to catch up on Fifteen's discography. I did pick up two more of their albums that were recently reissued and I'll be spending time with those and hopefully writing up a little something about them in the near future. Here we are, talking about singles from the very last Blues Brothers full length album, Made In America. As a whole, that album is one that I don't quite have the ties to like I have with Briefcase Full of Blues or the soundtrack to the movie. I never had Made In America as a kid, it didn't get added to my collection until I was a teenager. I'm not sure why, especially considering how much I loved the Blues Brothers at the time, but for whatever reason, I just never had it as a kid. 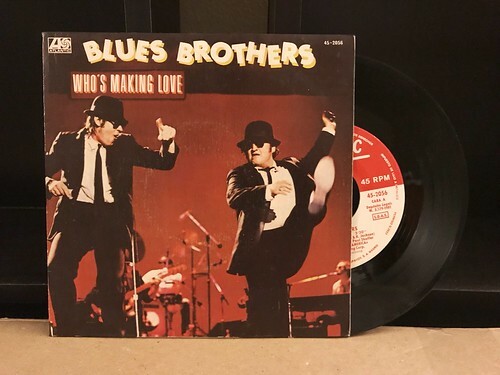 In the US, they did release "Who's Making Love" as a single, but it didn't come out with a picture sleeve domestically. This week's entry is from France. Artwork wise, they reuse the cover artwork from the Made in America LP, and just added some text about the songs on this 7". 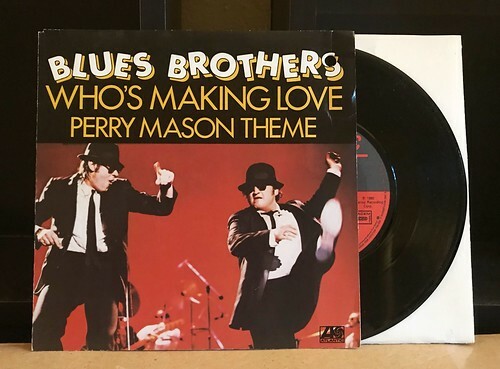 "Who's Making Love" doesn't pop for me quite the same way that other Blues Brothers songs do, but that's not to say it isn't still a pretty rousing version of this song. As usual the band is firing on all cylinders and Jake's vocals are fiery and on point. The B side they chose for this is a little bizarre. It's essentially an instrumental cover of the theme song to Perry Mason. I say primarily instrumental because for some strange reason, Elwood kind of mumbles along with the melody, occasionally spitting out a word that can be understood. It's totally fine in the context of the record as a brief interlude. But as a focused on B side, it makes less sense to me. 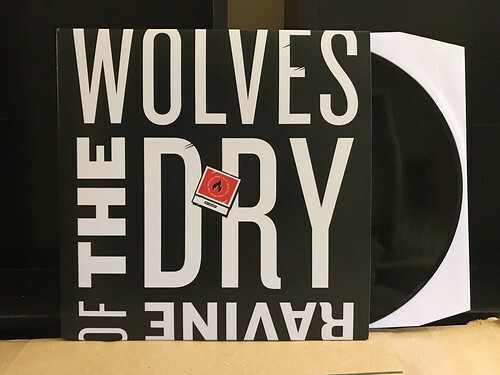 Wolves of the Dry Ravine have the dubious honor of being the record I review today because it's not currently packed away in a box somewhere. This one showed up during my move, so I happen to have it handy. The downside being that I haven't spent as much time with it as I typically like to before writing about something on this website, but luckily it's a really good album with short, catchy songs that sink in quickly. Each song is built off of a wonderfully full, yet not super distorted guitar tone. It has the right amount of fuzz, but mixed with just enough of the treble end of the spectrum to remain bright and shiny. In general, each of the album's fifteen songs clock in at about the two and a half minute mark, but man this band can cram an awful lot of hooks into those two minutes. It sounds like something that would have fit right in if it had been released on Ptrash and in particular, there are times where it reminds me of Sedatives, though without the dark vibe. This is most prevalent on songs like "Shut Down" and "Bow Down" where a little flourish of keyboard goes a long way. Having never heard this band before, I wasn't sure what to expect, but this Wolves of the Dry Ravine album is a really strong debut effort. Definitely worth checking out. It took a day longer than I expected to get back online and ready to write about records again. The new house is nice, but I'd be lying if I were to say it isn't pretty chaotic right now. The bulk of my records are still packed up in boxes, so it's going to be a little tricky to get reviews done this week. Luckily, I did receive one record in the mail during the move, and it's one I'm pretty darn familiar with. 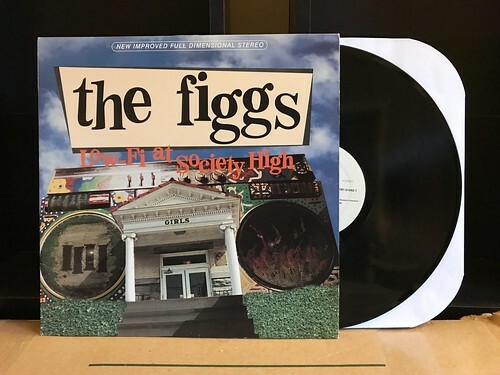 I had first heard of The Figgs when I picked up a 7" of the song "Step Back, Let's Go Pop." I think it was a promo single that I got for a dollar or something like that. It made me pick up the album it came from, Low-Fi at Society High. "Step Back" is the lead of track on the album and it really sets the stage for what is to come. Loud, crunchy guitars, building chord progressions, tight and punchy drumming and strong and catchy vocal melodies. While that sentence really exhausts my collection of adjectives, it really is the best way to sum up what a dynamic and easy to listen to pop rock band The Figgs are. I've had this on CD forever, but it took a while to grab the LP at a decent price. I've had my eye on it for a while and a reasonably priced copy finally showed up on Discogs and I decided it was time to finally add the vinyl version to the collection. The Figgs have been going for ages and they have a bunch of records out that I'm just not as familiar with. Low-Fi and their 1996 follow up, Banda Macho are the only records of theirs that I ended up owning. I probably should dig a bit deeper into their discography, but I've got a lot of other records to unpack first. As I had mentioned in one of my posts last week, my wife and I are moving into our first house. I thought that I might be able to prewrite a handful of reviews to keep things going this week, but it became clear very quickly that was not going to work out. All of my records are packed up. 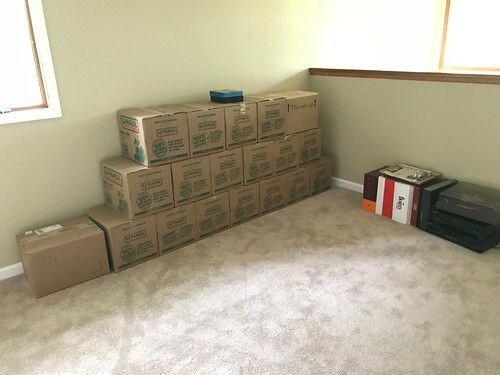 All of my LPs are in the new house, though my computer and everything else is still in my apartment. I'm going to just take a break this week, power through this move and hopefully be back at it on Monday. I'll be taking stupid pictures and complaining on Twitter during the move, so feel free to follow me there if you can't imagine going a week without my terrible writing.